The title of this post may be perhaps wrong…nobody in this film is part of The Mob, but it does involve stealing and thievery! This film is showered by A-listers, and I usually don't like films like that…they tend to be shallow and all about the 'celebrities'. This one is surly not like that at all! Everyone in it plays their role so well and it does not feel like they are trying to overshadow each others roles! 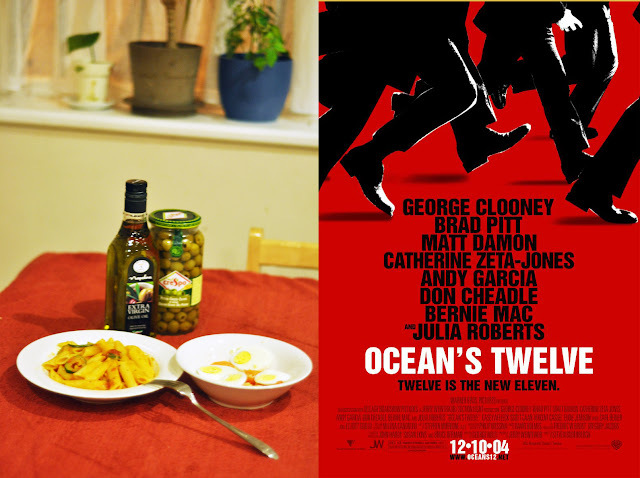 Ocean's Twelve is my favourite Ocean from the trilogy…Not sure how many times I've watched it, but I enjoy it every time! I mean the first time round, I got blown away by the simple intelligence and how they've managed to complete 'the mission'. Anyhow, not gonna spoil it for people who didn't watch it! Since some of the film is based in Italy (maybe most?) I have paired it with a simple Italian dish. Seriously, so simple that the picture will speak for themselves! Boil 2 fresh eggs, once done season them with lime, salt and a little bit of garlic. Not to forget Italy's favourite oil; olive oil. Add some sliced fresh tomato, and that serves as a salad. Well this is the film and food for this months…perhaps a more exciting dish for next month! This entry was posted in Food and Film. Bookmark the permalink.